Chocolate is magical. The cocoa industry is not. There are hordes of dirty, dirty skeletons in the closets of many in the chocolate industry, and most people haven’t got a clue what really goes on behind the scenes. Hundreds of thousands of men, women, and children work in hazardous conditions, live well below the poverty line, and are often working in forced labor situations (yeah, as in slavery) to bring the world its favorite treat. It is never cool to pay unfair wages and enslave workers. Universal truth. It is even less cool to sit idly by while this happens. So whether it’s a rally demanding Hershey, the largest chocolate manufacturer in North America, to be more responsible in sourcing its cocoa, or reaching for that Fair Trade Certified chocolate bar at the store, to simply educating ourselves about where our stuff comes from and at what cost, the reality is we can all stand to be more responsible consumers. 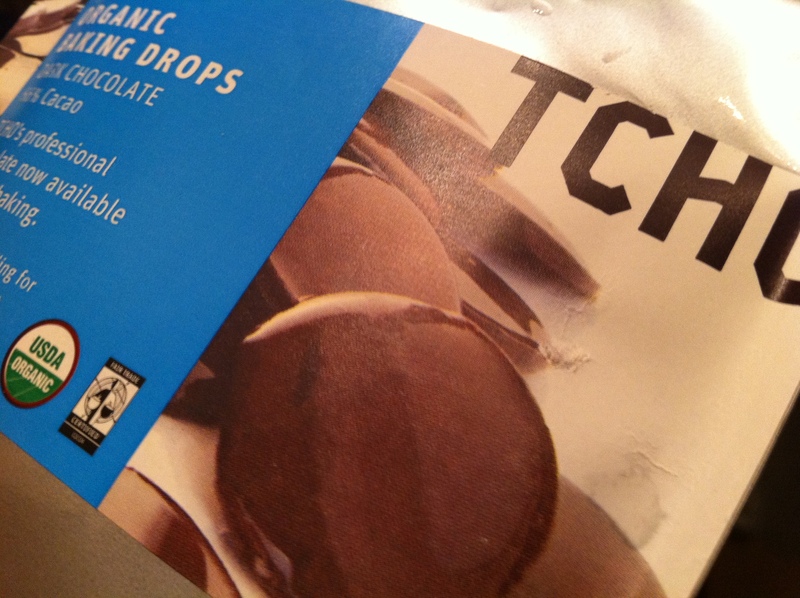 So when I see a chocolate company like TCHO, which describes itself as being the “direct, transparent connection between the farmers and the consumers, from the pod to the palate, from high concept to sensual experience,” I think yes please, I would like to buy your chocolate and support you and everything you stand for. TCHO is hip and exciting and yes, their chocolate is on the pricey side. But this is damn.good.chocolate. And every bite of their Fair Trade Certified goodness comes complete with a clear conscience and the knowledge that you are making the world a better place. Now there’s a good reason to bake a cake! P.S. If you live in San Francisco, you can check out the TCHO factory at Pier 17 and see firsthand their whole operation (it’s the only chocolate factory within SF city limits). They give FREE TOURS that come complete with a chocolate tasting. Lightly spray and flour a 9 x 13 cake pan. In a medium bowl, mix flour, baking powder, salt and turmeric together. In a separate bowl, cream together the margarine and sugar. Add the vanilla extract. Add the Egg Replacer mix–about a tablespoonful at a time. Mix until well incorporated. Add the flour in three increments, alternating with the milk–beginning and ending with the flour, mixing well and scraping down the sides of the bowl after each addition. Spread cake mix into prepared pan. Bake for 35-40 minutes or until toothpick inserted in middle of cake comes out clean. Beat the butter in a stand mixer until fluffy for about 2 or 3 minutes. Slowly add melted chocolate with mixer on low. After chocolate and butter are well combined, add vanilla, milk and sugar. Beat at medium low until just combined. This makes enough to frost 2 8-9 inch cakes. 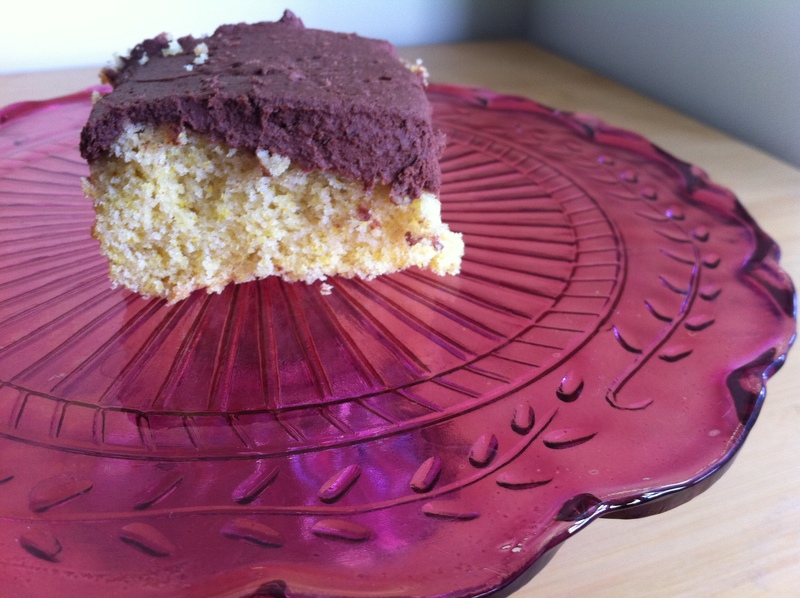 This entry was posted in Not pie, Vegan and tagged cake, chcolate frosting, tcho, vegan. Bookmark the permalink. The whole slavery and unfair practices issues when it comes to chocolate get blown out of proportion. Yes, there is the occasional forced labor that happens (as is the case with just about every industry in the developing world unfortunately), but this is not de facto in the industry. It’s often the case that some journalist will go to a cacao producing country and specifically try to find this story. Sometimes kids who are working with their families to harvest cacao will get classified as “forced labor” which, having worked in my family’s business growing up is a complete falsehood. Having been in the two largest cacao producing countries in Africa: Ghana & Ivory Coast and having lived in the later, I can say that it’s definitely not the most ideal way to live, but people generally get by on the salaries given the cost of living where they are. They should definitely get paid more and I’m not saying that we should rejoice in the system that exists, but the media in the US and UK have really done all they can to demonize the trade as it is very hard to fact check them unless you’ve spent a good deal of time. You might want to read up more here http://www.drogbascountry.com/ which is by a journalist I know well who is based in Ivory Coast and reports quite a lot on cacao farming. Thank you for taking the time to point this out. I really appreciate your comment and found myself nodding my head in agreement with everything you say (and kicking myself a little for coming off so biased and uninformed in my blog post). It’s not hard to believe that the picture of the cacao industry painted by the UK & US media is in many ways conflated and exaggerated. And yes, it certainly doesn’t help that there is not a lot out there in terms of any other side to the story. Certainly, it is not easy to find an unbiased critical analysis that examines the situation on a case by case basis and puts it into socioeconomic contexts. This is so often the case, and yet another example of good intentions not being good enough. Just as it is naive and problematic to engage in “charitable” work in a country that is not your own and of which you know little, I agree that it is also problematic to report on situations that can easily be misinterpreted or mistakenly assumed to be blanket truths across the board. Thank you for sharing the link to Drogba’s Country – this is extremely informed, helpful, and well-articulated information. is actually a gifted place. That is a point which is difficult to be contested. Hi Emmanuel – I absolutely agree. Too often we only focus on the negative stories coming out of a place, and it’s important not to let that become the dominant narrative. Thanks for your comment.